What Are Your Spiritual Intentions for 2016? At this time of year, there is much discussion about ‘New Year Resolutions.’ You may be considering changing a bad habit, or aiming for a new personal goal. Perhaps you wish to make some simple lifestyle changes to improve your health and well-being. Whatever your resolutions for this year, I wish you all the success you deserve in achieving them. But I also suggest that you set some spiritual intentions at the same time. Perhaps consider establishing a regular spiritual practice of meditation or affirmations each week, or strive to learn more about aspects of your faith and beliefs. One lovely way to start the year would be to join a local group. Meditating and praying together helps to keep us focused and grounded, and offers the opportunity to share our experiences and feelings. No local group? Start your own! I notice also that Mercury is in retrograde at this time, so it’s a perfect time to develop and use your communication skills, perhaps to take a course, or work with others? I call upon God’s grace, and all the angels, to help ALL OF US achieve our goals in 2016, whether they be spiritual, physical or emotional. I ask Archangel Michael for his power of discernment and protection, Gabriel for intuitive guidance, Jophiel for insight and enlightened wisdom, Raphael for the blessing of healing and knowledge, Zadkiel for personal transformation and enjoyment, Archangel Uriel for the energy and strength to continue serving as channels for Peace and Light, and Chamuel for the gift of abundant Love to share. And so, on the basis of feeling a lot ‘lighter’, by simply allowing, may I now pass on my heartfelt wishes to you for an abundance of love, good health, and laughter as well as all the projects you might be planning for over the coming year. May the angels continue to guide you, may your hopes and wishes be achieved – for the highest good of all – and may your friendships be many and your sorrows be few. 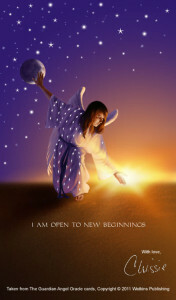 Are you called to start the New Year by developing your own spiritual growth and connection to the angels? Why not consider joining me on one of the Angel Discovery Days around the UK this year? As you may know, I write regularly for Spirit & Destiny, Britain’s best-loved spiritual lifestyle magazine. We have teamed up to offer these introductory workshops at half price – just 55 pounds per person. The theme this year is SEVEN STEPS WITH THE ANGELS. This year, we’re also introducing an advanced workshop on each Sunday – SHINING YOUR LIGHT. If you have ‘woken up’ to your spiritual nature, then join me for this extra one-day Spiritual Masterclass. You will deepen your spiritual practice, supported within a group of peers, and you will find knowledge, understanding and answers in a safe, warm space, held with love and sensitivity. Perfect for those who want to experience a full weekend of learn and spiritual growth, or for anyone who has attended previous workshops or courses. Whatever path you choose to follow this year, may I wish you all the love and abundant blessings of the Angels for 2016.